Nice wine racks in square modules measuring 60x60 cm. 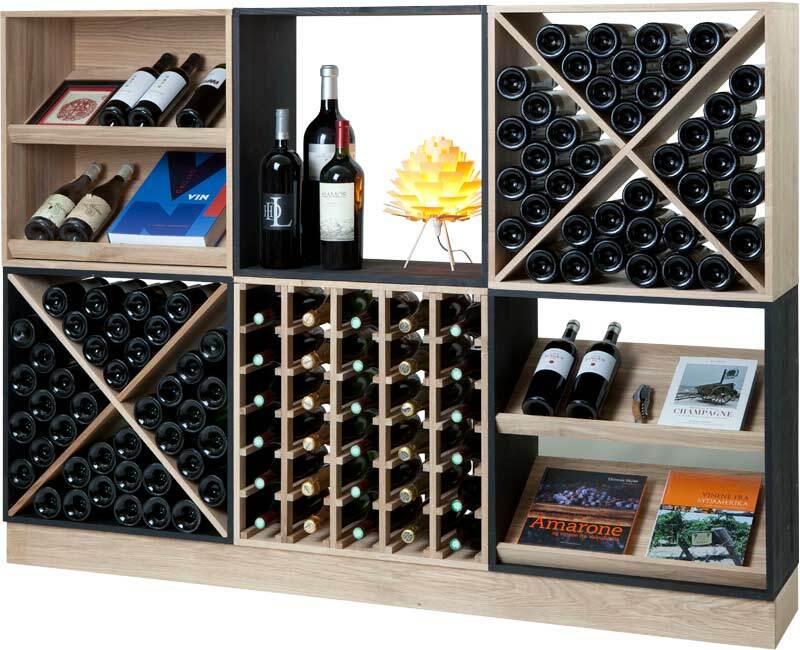 You can easily combine several modules into a splendid piece of furniture for your bottles. The Square wine racks are among the most robust and stable designs available for wine storing if the desired material of your wine rack is wood. The square shaped bottle racks, all of which measure 60x60 cm and 30 cm in depth, are inexpensive and they make designing your wine cellar incredibly easy. All you have to do is rack them up on top of each other. The boards and strips are 1,5 cm thick and therefore quite solid. The design exudes quality, it is classic and with a look that never goes out of fashion. As long as your floor is at level, you can stack the square modules on top of each other. In our shop, we have had no problems mounting four elements to build a bookcase with a total height of 240 cm. without assembling the individual elements further. See how it looks in the picture here. However, we still recommend that it is a good idea to anchor the shelves in the wall and attach the individual modules with glue and screws for safety's sake, when you build a wine rack that tall. 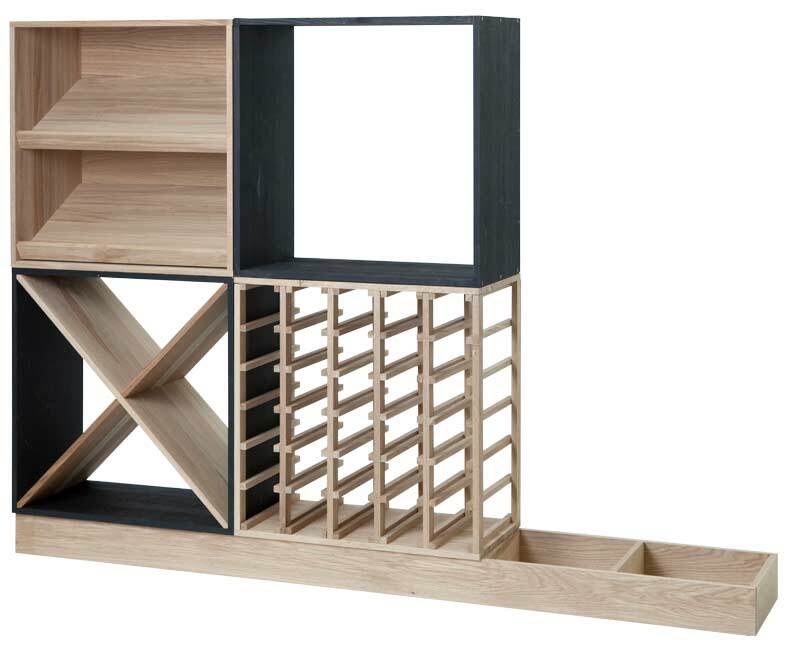 The point is simply to illustrate that Square is among the most robust wine racks in our range. The combinations are numerous when setting up Square wine racks. For example several racks can also be assembled as a freestanding piece of furniture with for instance a tabletop. Now you have a tabletop to stand around while tasting your wines. Actually, the entire construction is even more stable by getting a board mounted on top. Two modules on top of each other will easily become like a bar counter at a perfect height of 120 cm. You have basically built an entirely new piece furniture in itself. Here you can host tastings or you can put bottles with much sediment in an upright position so they are ready for future tasting. This is just a quick example of how you can use these Square wine racks. Surely you can come up with lots of ways to design your own room with wine racks from Square. There are three versions of the wine rack. You can choose the construction to be in either raw pine, burned pine, oiled oak or black painted frames with oiled oak fittings. The model named ABRA is in the classic design with a cross in a square framed box. The crossed divides the shelf into four separate sections, each of which can hold ten bottles. So this is a shelf for a total 40 bottles. This cabinet is suitable for storing bottles in odd shapes and sizes such as half-bottles and magnums. With ALDA you can store 30 bottles in a structure that makes it possible to pick a single bottle without having to move to other bottles. This is handy if you buy just one or two of the same wine instead of 6 or 12 bottles. 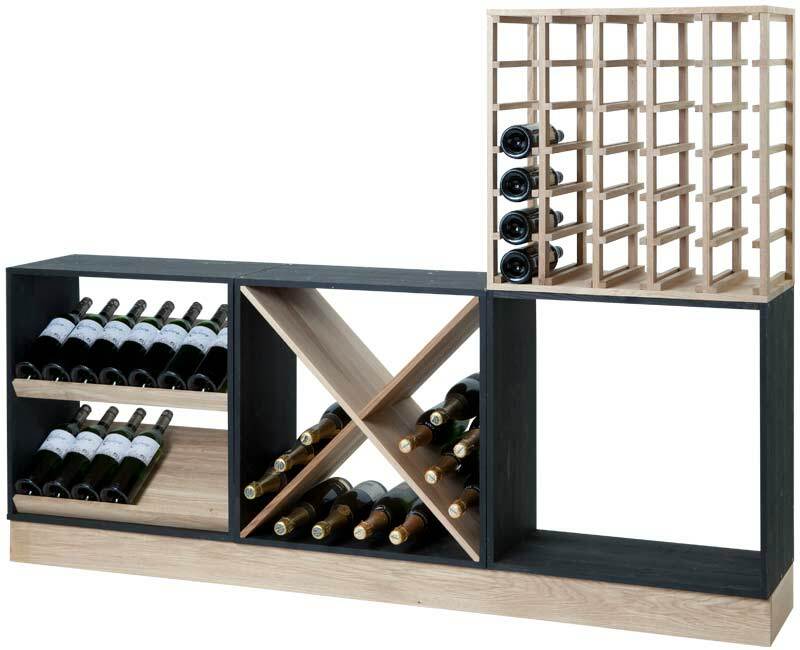 The display rack ANDINO is, as the name suggests, built with two shelves designed to have bottles on display. Here the bottles are placed in a nice semi upright position. The rack has a capacity of 14 bottles. All Square modules are delivered fully assembled, so the only thing you need to do is combine them to fit well into your wine room. However, the sockets are delivered unassembled, but with the use of a good screwdriver they are assembled in no time. If you want to refine the details a bit further, you can treat the raw pine modules with oil. This will highlight the grain and texture of the wood as well as protect the wood from dirt, water and drying out. Do not forget that you can use our unique online layout tool on this website. The tool has a lot of our racks and wine coolers so you can build ahead while the exact measurements are given in the drawing. It is such a clever device that we are still a little amazed over it.